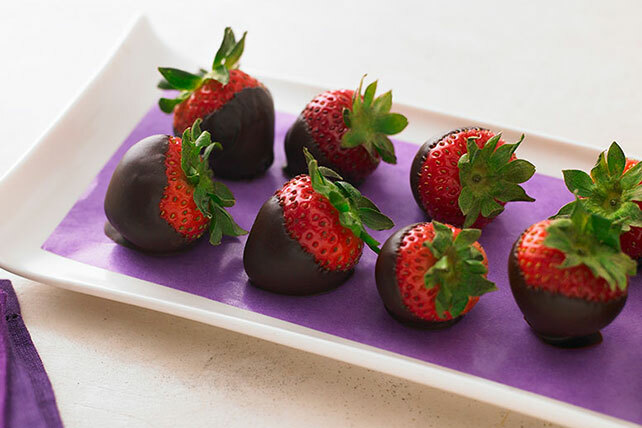 Celebrate any occasion with Chocolate-Dipped Strawberries. These sweet and juicy treats are easy to prepare at home! Prepare using BAKER'S Dark Semi-Sweet Dipping Chocolate. Melt 7 oz. BAKER'S GERMAN'S Sweet Chocolate as directed on package. Use instead of the dipping chocolate. For best results, serve strawberries the same day they are dipped. Prepare using 18 large strawberries. Makes 18 servings. When purchasing fresh strawberries, look for plump, brightly colored berries with a strong strawberry fragrance. If pre-packaged in plastic cartons, be sure to check the bottom of the container for any mushy berries or signs of mold. Store strawberries in the refrigerator and wash just before using.